A penicillin allergy is a bad reaction that your body has to penicillin antibiotics. This is the most common type of drug allergy. The reaction can range from mild to serious. 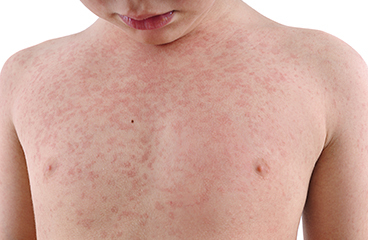 Common allergic reactions include rashes and swelling. But a severe reaction can cause trouble breathing. This can be deadly if not treated right away. A positive skin test for penicillin allergy. Hives that appeared right after you took the medicine. A bad reaction to the medicine in the past. People who have a penicillin allergy also may react to similar antibiotics. These include ampicillin and amoxicillin. Ask your pharmacist or doctor about these medicines. A skin test is the best way to find out if you have this allergy. Swelling of your lips, tongue, or face. If you have any of these severe symptoms, call 911 or other emergency services right away. A mild reaction often can be treated with antihistamines. These medicines stop swelling and itching. They can be bought without a prescription. Some people may need prescription medicine if over-the-counter medicine doesn't help. Taking a cool shower or applying a cool compress. Wearing lightweight clothes that don't bother your skin. Not using strong soaps and detergents. They can make itching worse. A shot of epinephrine is needed for severe reactions. Sometimes people also get antihistamines and other medicine in a vein. If you have any reaction to penicillin, let your doctor know right away. Tell other health professionals who treat you that you had a reaction to penicillin. It's also a good idea to wear medical alert jewellery that lists your allergies. Enter D159 in the search box to learn more about "Learning About Penicillin Allergy".